Project Description: Flying W Awards came to SDS with the main goal of redesigning their current ecommerce site into something that had functionality that would help make the process of purchasing trophies via the web easier. Under their old system, a customer would place their order and then Flying W would have to contact that customer to get their artwork and engraving requirements. This process created quite of back and forth communication with customers that made purchasing via the website a much harder than it needed to be. The answer to this first project goal, SDS implemented functionality on the item level pages that would allow a customer to either input their engraving text or upload a file containing that information. 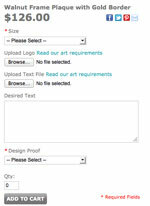 Customers are also able to upload their custom artwork files for various trophies. While the process of integrating file based uploads to the ecommerce platform was a fairly simple part of the project, there were quite a few security concerns that needed to be identified and accounted for. The end result was large amounts of back-end functionality to securely support an easy to use front end user interface. 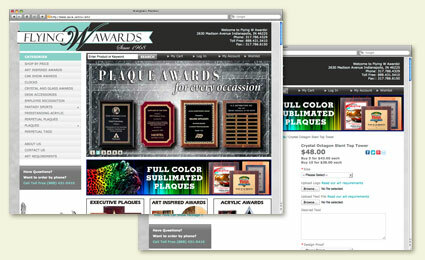 Another website goal Flying W Awards wished to accomplish dealt with the way their customers typically shop for products. Where most industries are typically browsed by categories, the trophy industry is generally browsed by price Due to the ambiguous nature of trophies, the engraving basically sets the function of the trophy, customers are more interested in fitting within a specific price range instead of what the trophy actually looks like. This goal also presented a unique challenge as most ecommerce platforms are built around the category browsing model. The SDS solution to the problem was to create an over view category that acted as the parent to all of the other categories. The client would input their product catalog just as any other client would, but the website would automatically create a catalog view titled "Shop by Price". Additional functionality was put into place on all category views that would allow them to limit the categories and subcategories into a specific high / low price range. This price range was set by the customer using a high and low slider for price along with a check box interface to limit the categories being viewed. The end result was an ecommerce site with an updated look & feel that exceeded all of the clients goals and allows them room to grow as they continue to increase their web sales.